First, one of our Xpert estimators will examine your vehicle to determine the severity of the damage. If the damage is minor, we will write an estimate at this time for vehicle repair. If the damage is more substantial, or we feel there may be hidden damage, we may recommend an x-ray estimate on the vehicle to be sure that we have a full understanding of what repairs are necessary. We’ve been trained on the latest estimating systems, including Pathways CCC, Audatex, and Mitchell. In addition, our stores are electronically linked directly to over 25 different insurance companies as part of their Direct Repair Programs. This means less wait time for our customers. Being part of an insurance company’s direct repair program allows us to submit your claim immediately. 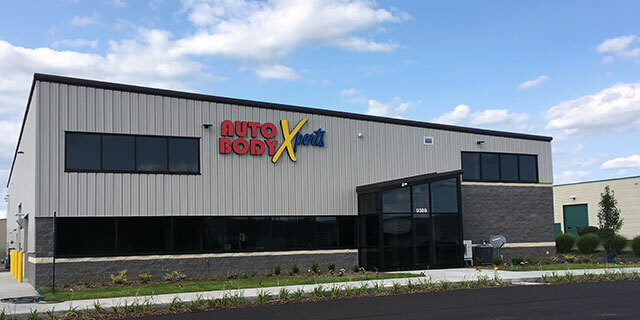 Our Xpert auto body repair technicians will prepare and install new panels or repair reusable panels. Panels needing repair will be returned to pre-accident condition. Priming, sealing, and corrosion protection is then added to the new body where applicable. All work is then inspected, tested and signed off on internally to ensure quality. If your vehicle is found to have damage to the frame or unibody, our Xpert frame repair technicians will electronically measure your frame. We use state-of-the-art measurement equipment called Blackhawk Shark. This allows us to measure up to 12 different points on the vehicle at the same time to ensure that the repair of your vehicle’s frame meets our Xpert safety standards. Once repairs are completed, our Xpert paint department will go to work preparing your vehicle for paint. During this process, we will scuff and sand all panels needing to be painted. Scuffing the vehicle helps the new paint adhere. Then, all panels not needed to be painted will be covered with automobile masking products. Then we use static towels to wipe down the vehicle removing foreign materials left on the vehicles surface. After the vehicle has been properly prepared and masked, our Xpert paint technicians will move the vehicle into one of our downdraft paint booths. These are custom built to minimize pollution, offer a more controlled painting environment, and promote an all-around superior finished product. Once the vehicle is sealed in the paint booth, our paint technicians will apply color to your vehicle. We use PPG waterborne paint for all our base color paint. Our Xpert detailing department will clean your vehicle, inside and out, to make sure it’s clean and ready for you.